Suvar-loka (alternatively Swar-loka) is described as regions of space beyond Bhuvarloka. Some description makes it a planet inhabited by the Devas with their king Indra. Some references make it equivalent to the Swarga (Biblical Heavan, Jannat as described in Quran) where good souls go (after death) to reap the benefits of their good Karma (good deeds). Some Puranic references equate Suvarloka to the Solar System. As per these the Suvar loka is consisted of nine sub divisions or sectors called 1) Druva Mandala, 2) Sani Mandala, 3) Brihaspati Mandala, 4) Angaraka Mandala, 5) Sukra Mandala, 6) Budha Mandala, 7) Nakshatra Mandala, 8) Chandra Mandala, 9) Surya Mandala. As for the inhabitants of Suvar Loka, the Human Beings are one amongst them. Of this, Surya Mandala is identified with the Sun and the solar neighborhood (space surrounding the Sun). 'Surya' means 'Sun'. 'Mandala' means 'region' or 'sector'. Chandra Mandala is same as Moon and the lunar-neighborhood. Chandra means Moon (Earth's natural satellite). An alternate view is that Chandra Mandala is the spherical-shell containing the orbit of Moon. Surya Mandala would then be the spherical-shell containing the apparent orbit of Sun around Earth. In this case Surya Mandala would be inner to the Chandra Mandala (a wrong model). Another way of looking at is that Surya Mandala is not the Mandala of the Sun but the projection of the Sun in the sky of Earth. Nakshatra Mandala is the region where the stars apparently appear. The word 'Nakshatra' is usually taken to mean 'star' but its actual meaning is 'star-field visible in the night'. 'Naktha' means 'night', 'Kshatra' / 'Kshetra' means 'field'. 'Naksha' means 'map'. Thus Nakshatra is 'stellar map' or 'star field' or 'regions of stars' visible in the night. Thus Nakshatra Mandala can be appropriately described as the as a large sphere surrounding the Geoshphere. The stellar neighborhood of the Solar System is projected onto this sphere, which is otherwise perceived as the starry night sky or the stellar map (Nakshatra) by the observers on Earth. This Mandala is perceived by the ancients as outer to the Chandra Mandala but inner to the Mandalas of the Planets (Mercury, Venus, Mars, Jupiter and Saturn). The Mandalas of Budha, Sukra, Angaraka, Brihaspati and Sani are the regions around the planets:- Mercury, Venus, Mars, Jupiter and Saturn respectively. An alternate view is that these are spherical shell regions in which the respective planet's orbits are situated and these shells contain one after the other in the order of Mercury, Venus, Mars, Jupiter and Saturn. Dhruva Mandala is the region related to the pole star (now Polaris). 'Dhruva' is the Indian name for the Pole star. 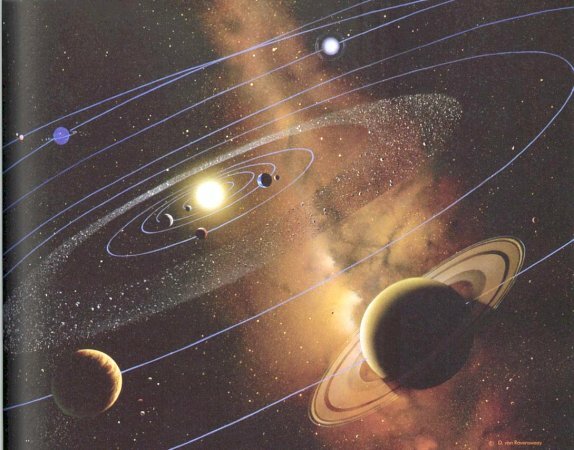 It could mean the region of Solar System in the direction of the Pole star of Earth. Then it would be the northern Polar region of the Nakshatra Mandala. An alternative view is that it is the region surrounding the Nakshatra Mandala and the outermost Mandala of Swar Loka. It is to be noted that the status of pole star changes from star to star due to the precession of Earth's rotational axis, taking about 26,000 years to complete a cycle. The star Vega (Abhijit) was the northern pole star around 12,000 BC (assumed to be the dawn of ancient Indian civilization). From about 4300 BC until 3942 BC, Theta Boötis was the closest star to the celestial north pole visible to the naked eye. The star named Thuban was the naked-eye star closest to the north pole since 3942 BC (assumed to be the start of Epic age in India when Mahabharata and Ramayana and much of the Vedas were composed). It was closest to the pole in 2787 BC. Thuban was considered the pole star until about 1900 BC. Kappa Draconis was the nearest star to the North Celestial Pole visible to the naked eye from 1793 BC to approximately 1000 BC. However, because it is so much dimmer than nearby Kochab, Kochab was considered the pole star during that time instead. Kochab and its neighbor Pherkad are both naked eye stars and are sometimes referred to as the "Guardians of the Pole". They served as twin pole stars, Earth's North pole stars, from 1500 BC until 500 AD. Since 500 AD Polaris is our Pole Star. In future, Gamma Cephei around AD 3000 and Iota Cephei around AD 5200 will become Pole Stars. Deneb will be within 5° of the North Pole in AD 10000. The brilliant Vega, often touted as the best North Star (the Pole Star of 12000 BC) and will became Pole Star again in AD 14000. This change in the Pole Star, approximately once in every 1000 years, is the basis of the ancient Indian Yuga System. It is also the basis for the notion of different Dhruvas and different Manus for every Manvantara (epochs of time) often expressed in the ancient Indian Puranas. Vishnu Purana: Chapter 7:- Above Dhruva, at the distance of ton million leagues, lies the sphere of saints, or Mahar-loka, the inhabitants of which dwell in it throughout a Kalpa, or day of Brahmá. Maharloka is described as the place of saintly souls (as per Vishnu Purana) and is considered as greater than the Suvarloka (Heaven or Jannat where ordinary people's souls go after death). As per some other Purana, it is said that the souls of the Saptarshis (the Seven Sages of Ancient India) reside here with a watchful eye upon the activities of humanity on Earth. We are unable to verify if these are true or false. But, going by our understanding of the already discussed lokas (worlds) Maharloka can be equated to the region (Stellar Neighborhood) where all the stars visible to us including our Sun (and thus the Suvar Loka or our Solar System) is situated. Inhabitants of Mahar Loka will thus belong to an inter stellar civilization. All of the 27 Nakshatras known to the ancient Indians too belongs to this Mahar Loka. It is the world of the stars that are visible to us. It can be equated to the local regions of our Galaxy such as the Local Fluff and the Local Bubble or to large and distant [wikiepdia:Star_cluster]s.
The Local Fluff is the interstellar cloud roughly 30 light years across through which the Earth's solar system is currently moving (Entry:- 44,000 and 150,000 years ago; Exit:- 10,000 to 20,000 years from now). The Sun is embedded in the Local Fluff, as are a few other nearby stars including Alpha Centauri, Altair, Vega, Fomalhaut, and Arcturus. The Local Bubble is a cavity in the interstellar medium (ISM) of the Orion Arm of the Milky Way. It is 210 to 815 light-years across. Vishnu Purana: Chapter 7:- At twice that distance is situated Janaloka, where Sanandana and other pure-minded sons of Brahmá, reside. Jana Loka is described greater than Mahar Loka. It thus contains the Mahar Loka, the world of the stars visible to us. Hence this can be equated to the Milky_Way Galaxy itself. The word 'Jana' means people. In this case, Jana Loka thus becomes the world of people belonging to the Milky Way Galactic Civilization. Vishnu Purana: Chapter 7:- At four times the distance, between the two last, lies the Tapo-loka (the sphere of penance), inhabited by the deities called Vaibhrájas, who are unconsumable by fire. Tapo Loka is described as 'greater than' or 'beyond' or 'above' the Jana Loka. Based on our analysis this becomes thus region of space 'containing' the Jana Loka (the Milky Way Galaxy) and several other Jana Lokas (Galaxies). It is thus the world of the Galaxies visible to us, including the Milky Way Galaxy. Thus it can be rightly equated with the inter-galactic structures like the Local Group of Galaxies, the Virgo Super Cluster of Galaxies and the Pisces Cetus Super Cluster Complex. The inhabitants of this world of Galaxies thus would be people belonging to an inter galactic civilization. If the narration is to be believed, they are the deities known as Vaibhrajas who are unconsumable by fire. Vishnu Purana: Chapter 7:- At six times the distance (or twelve Crores, a hundred and twenty millions of leagues) is situated Satya-loka, the sphere of truth, the inhabitants of which never again know death. Satya Loka is described as the Loka greater than the Tapo Loka. It comes first among all the 14 Lokas. It can be equated to the Universe itself containing several Worlds of Galaxies (Tapo Lokas). As per many Puranas, the Satya Lioka is the abode of Brahma, the God of Creation. Some Puranas describe Brahma as residing in a Cosmic Egg, the Egg of Brahma or Brahmanda. The Universe indeed can be conceived as a Cosmic Egg. Some Puranas consider a Lotus which sprang from the naval of Vishnu, the primordial being, as the abode of Brahma. Due to its expansion from a Singularity (a hyper-massive black-hole of infinite mass and infinitesimal size), the Universe indeed looks like a lotus sprang from a navel, except that we need to consider it as a four dimensional (4D) lotus rather than a three dimensional (3D) one. In this case 'the naval of Vishnu' can be equated to the Singularity from which our Universe has sprung up. Thus 'Satya Loka' is same as 'the Lotus that sprang from the naval'. It is same as our 'Universe' itself. It is also the 'Brahmanda', the 'Egg of Brahma' in which Brahma resides. The etymology of the word 'Vishnu' means 'that which expands (vis:- expand)'. The etymology of the word 'Brahma' to means 'that which is big or that which is expanded (Brh:- expand, grow, large)'. Both of these words (personified as Brahma and Vishnu) signifies the expansion of the Universe (a property inherent in the Universe). The inhabitants of this Cosmic World are mentioned as immortals (ie, they exist till the universe exists).